This past July, as reported in Breitbart, Zakkout posted on his Facebook page the following in Arabic: "Praise be to God, each day we conquer the American Jews like our conquests over the Jews of Israel. Your brother, Sofian"
While Zakkout is the main driving force behind AMANA, Ruiz is not a minor player. Ruiz plays a major role in promoting the group's Islamist agenda. In the time Ruiz has been involved with AMANA, the group's website has included various material vilifying Jews, Christians and homosexuals; the website linked to al-Qaeda financing and recruitment sites; and the website prominently featured an anti-Semitic video of David Duke on it, which brought on a condemnation of AMANA by the Anti-Defamation League (ADL). In one article previously found on Ruiz's AMANA website, it is stated, "Every believer [Muslim] should firmly believe that the Jews and Christians are kuffaar [infidels] and enemies of Allaah, His deen, the Prophet Muhammad, and the Believers… The efforts to gain the friendship of the Jews and Christians are useless, as they will never be pleased with the Muslims until the Muslims follow their religion." Ruiz additionally is the Executive Director of AMANA's sister organization, American Muslims for Emergency and Relief (AMER). AMER uses the same Miami physical and mailing addresses as AMANA. According to Ruiz's bio, he worked as a chaplain at the Immigration Service Processing Centers in Puerto Rico and in Miami. Question: Did Wifredo Amr Ruiz go to seminary and take up chaplaincy specifically to better serve the radical Islamic goals of his bigoted group AMANA. Today, Ruiz acts as AMANA's legal advisor. However, he also does legal work for another Islamist organization, CAIR. He is CAIR-Florida's legal counsel. The rally was supposed to be in support of Gaza, but it quickly turned into one that was instead pro-Hamas. A smiling Sofian Zakkout is seen on video, as coordinated chants of "Let's go Hamas" and "We are Hamas" are shouted from the crowd. A reporter was also assaulted by rally goers, targeted for being Jewish ("Zionist"). CAIR issued a statement saying that it had nothing to do with the rally, but a flyer for the event clearly shows the CAIR-Florida logo next to its AMANA logo counterpart. 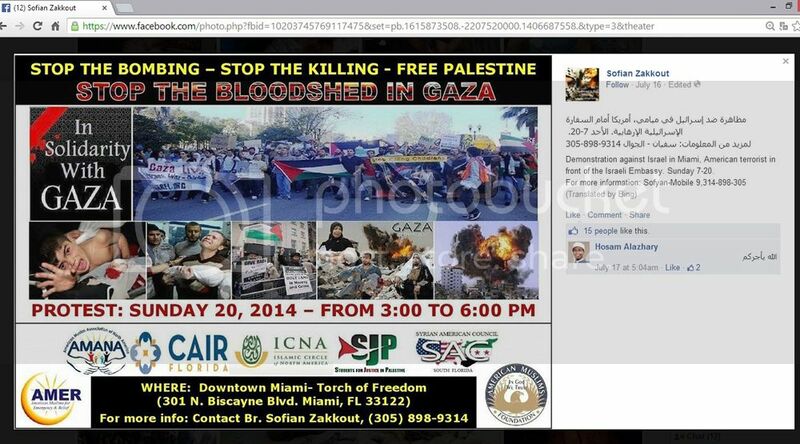 AMANA's Zakkout organized the rally, and numerous pictures of the flyer are still found on his Facebook site. These flyers are not unlike the flyers that were made up for the other rallies involving CAIR and AMANA, containing CAIR and AMANA logos. Ruiz was caught on video having words with the protest organizer. He asked the organizer if he had "ever served" [in the military]. He asked the organizer if he knew "who is a patriot," and then stated emphatically "I'm a Naval officer, brother." In Ruiz's case, the answer is clear. His involvement with CAIR and AMANA negates any pretense of patriotism, and instead open the door for questions about subversion.